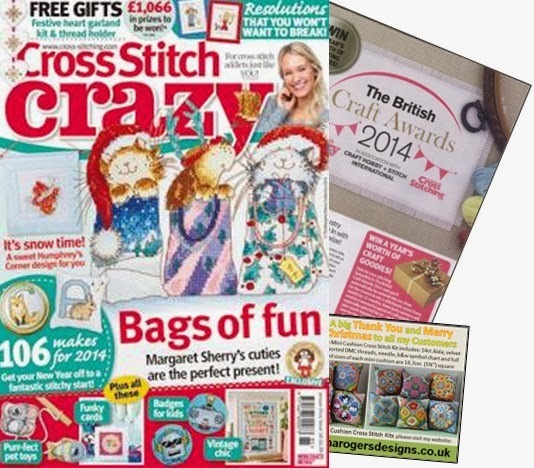 Sheena Rogers Designs: A change from cross stitch! A change from cross stitch! I'm having great fun at the moment making lots of little gifts and decorations to put on my stall at a craft fair I'll be attending next week. I pulled together all the crafty bits and pieces I've accumulated over the years including beads, felt shapes, tassels, braids and ribbons and I've made a variety of Christmas decorations and handmade gifts. I have lots of cones of stranded cottons which I use to make up my cross stitch kits, but once all of the cotton has gone I'm left with lots of cardboard cones and I hate to throw anything away that I think I may be able to convert into something else someday, so this craft fair has given me the opportunity to put some new ideas into practice! I've taken some of the empty cones and painted them to make them into fun pencil pots. I made little hanging fobs which I attached to pencils and voila! Here's a pic of the finished articles! I've also been making lot of things from felt fabric, including heart shaped decorations, hanging stockings, Christmas trees and some ever-lasting cup cakes! I shall post a photo of the finished stall after the event and fingers crossed that the items sell well. 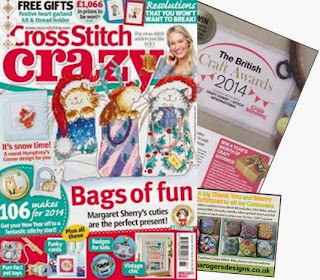 There is still time to vote in these awards and issue 185 of Cross Stitch Crazy magazine, out in UK shops now, includes another voting form as well as my Christmas advert. I couldn't sign off this blog post without mentioning my latest cross stitch designs so I can say that I'm working on two mini cushions at this minute. One is titled 'Beside the Seaside' and it is lovely to work on a Summer design on these cold bleak days! The other features road traffic signs and I've yet to name that one. My latest mini cushion to be released was titled 'Christmas Geese' and this one was born through an error I made in my thread ordering! You see, I heavily over-ordered on the Red (817) stranded cotton so I gave myself the challenge of designing a mini cushion which heavily features this colour. With this particular shade of red being very Christmassy, I couldn't resist designing another festive mini cushion. So here is the result, which I am very pleased with as it will fit into my Christmas decorating theme at home this year. They are all lovely but those geese are adorable! Good luck with the craft show and with the exhibition too.